Categories: Aqua / Turquoise, Yellow. 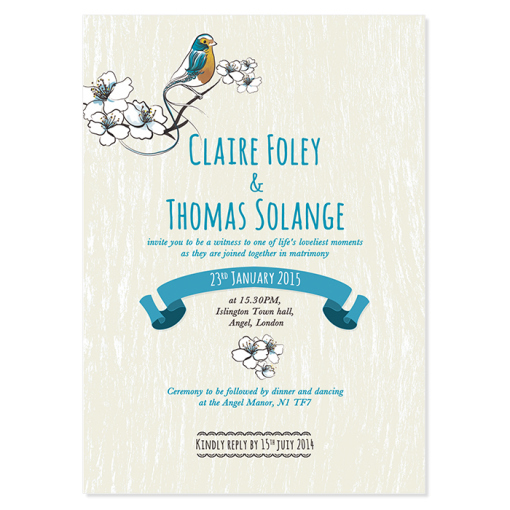 Add some ‘tweetness’ into your wedding stationary with these super sweet invitations by Pepper & Joy! We are in love with this cute wedding invitation, featuring a pretty little bird sitting on a beautiful cluster of blossom, modern typefaces and a decorative scroll. This design sends out retro vibes with a contemporary twist, the perfect combination for a unique start to your big day! Choose from a choice of colours, ranging from vibrant lime to sophisticated charcoal and everything in between… such as framboise, grape, pale rose, mimosa, very vert, bordeaux, marine, black cherry or gold, to name but a few! Whatever look you’re going for, there is most certainly a colour to suit your wedding scheme! The names of the soon-to-be-married couple are written in a super cool typeface, followed by the wording of your choice which is placed just above the scroll that features your wedding date. A few more details and another blossom hit and the invitation is complete – not forgetting the intricate scalloped edge border that surrounds the RSVP details! Because the colours are an important part of this design, only the finest digital printing processes are used to guarantee the bright colours ‘pop’ on first sight throughout – after all, nobody wants to receive a dull looking invitation which lacks lustre in the post, do they? Your Mother’s right, first impressions count! Team this with the slightly textured 250gsm superior matt paper and you have yourself a high quality, all singing and tweeting wedding invitation that is sure to please everyone on your guest list!